nokia n9 doesnt have a front cam. its a censor. please correct it. "and being obsolete 6 months after the purchase"
Will the device stop working as it is now, beautifully intuitive and fast, when an update arrives? What does that "update" even mean? What if Nokia made the original software near perfect, and only releases bug fixes. Does that make the device obsolete in 6 months? I dont think so. Reasoning that way, we could say every Android phone ever produced will be obsolete as soon as the N9 lands. Once for all: it has radio yes. Not yet implemented by any software, but Nokia developers are working on it. 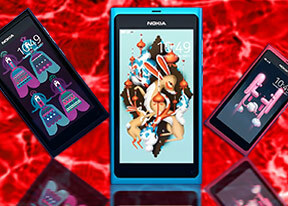 The N9 is not selling yet. Please be patient. Let's wait until September and read the reviews. Mark, 30 Jun 2011Openoffice good enough for you? That sounds really great for me!!!! AnonD-12389, 30 Jun 2011Will this phone have an X-terminal like the Nokia N900?Not preloaded, but easily downloaded and enabled. You can root the phone by toggling a button in the settings menu. Easiest root ever. First time Nokia with such powerful 1 GHz processor..
the price will be about 500. Anonymous, 30 Jun 2011"it will also support Linux apps".. Can u explain it,.. How does it can support,... moreOpenoffice good enough for you? Nokia just cloesd their US online store so let's see where you're gonna get the N9 from? Anonymous, 30 Jun 2011"it will also support Linux apps".. Can u explain it,.. How does it can support,... moreYes dude, we can run desktop linux apps. Excellent outlooking and specifications, Hopefully it will hit in market. AnonD-7134, 29 Jun 2011Guys, don't worry about apps. It will support Nokia Qt. (means app from Ovi store), Android app... more"it will also support Linux apps"..
Can u explain it,.. How does it can support,,,coz of same linux kernal shared?? Any app can u quote..
And is there a way to run linux desktop apps?? Nokia is really great but am happy the way they bring out phone without letting we the end users to enjoy our money b4 they bring out newer model,is not fair.For that reason I let Nokia to iPhone 4.